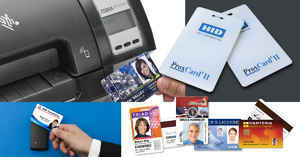 Universities and colleges use ID badges and access cards to help control student population, provide access to facilities, and even pay for on-campus purchases of food, laundry usage, and printer or copier use. Here�s one way a K-12 school district, University or college campus can put school ID badges and access cards to excellent use. In addition to clearly identifying who are students, teachers, administrative staff, and visitors at a glance, here are a few additional ways you can make your school ID badges work for you. Prepaid Debit Card. Imagine how quickly your school cafeteria line can move if students don�t have to use cash to purchase meals. Students can swipe their prepaid cards through a reader, which deducts the cost of the meal simply and quickly. Reduce paper. Store student information like class schedule, emergency contact information, and even what medications students take on student ID badges for quick and easy access. Track access and usage. Student ID badges can be used to track who has access to a variety of facilities, like labs or classrooms, and equipment, like athletic workout equipment, library books, audio-visual equipment, computers, and other technology. Track attendance. You can easily track attendance, monitor after-school activities, and allow access to special events. Student ID badges can also be used to ensure students get on the right school bus at the end of the day. There are a variety of features you can incorporate into your student ID badges that will enhance security and safety of all students, faculty, vendors and visitors. Consider using different color cards to visually identify student, faculty, vendors and visitors at a glance. Or if you want to use the same color cards for everyone, you can put a different colored bar at the top of each badge to help distinguish between the groups of people in your facility. Custom or stock Holograms offer a higher level of visual security that is tamper-proof and difficult to reproduce. Visitor badges can be low-tech or high-tech, depending on your security requirements. You can go with a different colored badge or bar at the top, or you can choose self-expiring badges that change color or have text show up when the badge�s time limit is expired. Either way, you get an instant visual verification of who should be on your school�s campus and who shouldn�t. IDSecurityOnline lets you customize your system to ensure it meets both your functional and security needs. Every security program can be designed to grow with your security requirements. 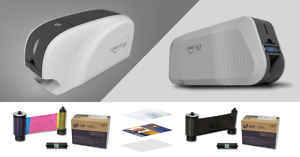 Enhance your existing security program by choosing different cards, upgrade the printer for more functionality, or select a better camera for your photos. 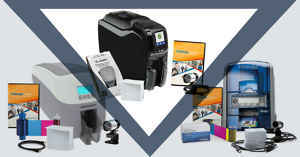 Our ID professionals are vendor-agnostic, which means you get our expert guidance and advice that�s not connected to any one brand of card printers. 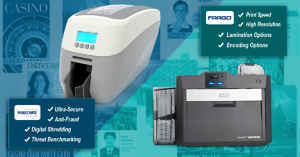 We help you find the right make and model card printer that fits your security needs, the functionality you desire, and within your school�s budget. Finally, our low prices are guaranteed. If you should ever find security equipment from another reputable vendor with a lower price, simply call our customer service reps, and we�ll meet or beat their price. 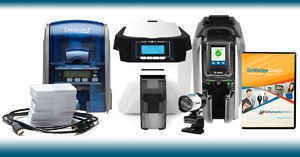 This is our way of providing all of our customers the best of all worlds: experts who will assist you to find the specific ID system for your needs at the lowest price available anywhere.